Chicago Sun-Times arts/entertainment writer Thomas (The Second City Unscripted: Revolution and Revelation at the World-Famous Comedy Theater, 2009) uses a combination of previously published materials, police reports, letters, and firsthand interviews with family members and famous comedians—including Jay Leno and Julia Sweeney—to put together a chronological narrative of the life and murder of the beloved comedian. Hartman was the star of the NBC sitcom NewsRadio, the voice of several classic roles on The Simpsons and an eight-year veteran of SNL, where he was nicknamed “The Glue” for his versatility and skill at keeping the cast cohesive. At 49, Hartman was murdered in his sleep by his third wife, Brynn, who killed herself several hours later. Thomas begins with exhaustive quantitative details from Hartman’s childhood—such as a nearly full list of his middle school report card grades—but the pace and quality of the book pick up once it moves into Hartman’s adult life. 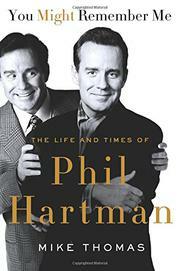 Readers will be entertained by learning the lesser-known facts about the beginning of his career—Hartman did a stint designing album covers for high-profile clients like Crosby, Stills & Nash for his brother’s production company—and the illustrative anecdotes of the Hollywood and New York comedy scenes in the 1980s and ’90s. While Thomas provides some clues about Hartman’s often guarded personality, large questions about his personal life and untimely death go unaddressed. Thomas is intent on celebrating the talent and career of Hartman, but he offers little conclusive insight into what was all too clearly a troubled marriage. Fans will likely find it an entertaining but ultimately unsatisfying read.